PROGRAM: ARGENTINA VICE VERSA. SJOKK OG VIRKELIGHET I ARGENTINSK FILM (1998 - 2011). FILMCYCLE & SYMPOSIUM. CINEMATEKET OSLO. SEPT. 27TH - OCT 6TH. www.nfi.no. 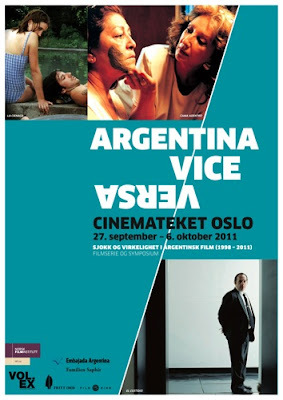 The event is realized under the patronage of the Argentine Embassy in Oslo with support of the Norwegian Filminstitute. It is funded by Fond Fritt Ord and Fond Film og Kino. Argentinian cinema till today indicates how deeply neo-liberal policies and their failure have penetrated the organisation of labor, family, intimacy and public life. Even though the country´s economic break down began in the 90ies, it meant a massive shock to the country´s population when in 2001 the Argentinian state had to declare its bankruptcy. The economic crisis signified an all-embracing representational crisis: People lost faith in the stately system as democratic force, in money as reliable representative of value, as well as in mass media and their modes of representing reality. Parallel to Argentina´s economic degradation, the local film industry went through a internationally acclaimed creativity and quantity boom. The film makers succeeded to develop their genuine cinematographic language to mirror the radical transformations of society and concepts of reality. Their cinema has become a relevant inspiration and impulse for renewal. BUDGET SHORTNESS AND INFORMAL PRODUCTION MODES. The film industry in Argentina got heavily effected by the collapse. Costs for film stocks as imported products tripled with the rapid devaluation of the peso while funds massively had been cut down. Despite of budget shortness, film creators developed inspiring strategies to produce often without waiting for funds to come in. Literally filming in the grandmother’s living room, they were often supported by family members and friends as crew. Many directors took the role of producer, cinematographer or editor for others or produced their own films. Consequently, informal structures granted a greater artistic freedom and have led to a softening of fixed roles, gender boundaries and standard formulas of movie making. The financial constraints often unleashed synergetic effects with the film makers’ attempts to question established modes of reality representation. Most films reject both, symbolism and didactic political messages. Depicting highly subjective worlds, they investigate and introduce distinctive living environments of the people. Both due to budget limitation and as aesthetic choice, the films let enter physical reality in form of location, character, action, time or relation. Merging formal and narrative elements of documentary and fiction film, the movies question the strict distinction between the genres. This segment is dedicated to the interrelation of economic system and social bonds. The 90ies in Argentina were a time of artificial wealth, based on short-term profit-oriented privatizations, until this bubble burst with the crash. In SILVIA PRIETO (1998) Martin Rejtman shows with humor the unconcern of the 90ies and the weakening of social relations in times of total ephemerality. Jobs and partners are exchanged with the same easiness as the tester of the brandnew American washing powder “Brite“ is spread around. Pablo Trapero’s MUNDO GRUÁ – CRANE WORLD (1999) registers, how this lightness begins to be undermined by a threat of unemployment and the devaluation of work. Rising unemployment and criminality accompanied by a media campaign claiming the threat of “the insecurity“ have led to an increasing social segregation in Argentina since the mid of the 90ies. There has been less and less mobility between the classes. The living worlds depicted by the curated films are increasingly closed systems. LA CIÉNAGA – THE SWAMP (Lucrecia Martel, 2001) shows the degeneration of a high-class family that tries to expel all danger of the outside world, like a lake without inflow that tends to tilt. LOS MUERTOS – THE DEADS (Lisandro Alonso, 2004) follows the journey of the outsider Vargas, when he gets released from prison, where he spent half of his life after seemingly having killed his brothers. Without stately protection thousands of people in Argentina lost money, future plans and identity in 2001. In CAMA ADENTRO – LIVE IN MAID (Jorge Gaggero, 2004) Señora Beba desperately tries to maintain the image of her former wealth. Her only support is her maid Dora, whose wages Beba cannot pay anymore. In the comedy ABRAZO PARTIDO – LOST EMBRACE (Daniel Burman, 2004), the Jewish-Argentine Ariel dreams of getting a Polish passport to escape the shop gallery in Buenos Aires, where he helps out his mother in her underwear-shop. Also on a national level Argentina experienced a shift of identity, from a country of opportunities it descends to a place of emigration back to Europe. The films denote how a crisis can open room for a further questioning of social role models and relationships. Shot during the high-peak of the crash, TODO JUNTOS – EVERYTHING TOGETHER (Federico León, 2002) describes the putridity of a couple unable to separate until a humiliating turning point. The actors are the director and his girlfriend themselves, who were actually splitting up. IV ABSENCE OF THE STATE AND CRIME. In the urban western UN OSO ROJO – A RED BEAR (Adrian Caetano, 2002) the state’s power is expressed exactly in its weakness as its failure heavily effects people’s lives. When Bear comes out of prison after the economic collapse of 2001, he finds an altered Buenos Aires where crime and self justice rule. EL CUSTODIO – THE MINDER (Rodrigo Moreno, 2007) describes the life of Rubén, guarding a minor important minister who is not really in danger. Arbitrariness, boredom and dependency create an unpredictable mixture that discharges at the film’s show-down. LOS RUBIOS – THE BLONDS (Albertina Carri, 2003) goes further back in Argentina´s history, following the traces of the director’s parents. Those were two of 30.000 that “disappeared“ during the military dictatorship in Argentina (1976 - 1983), kidnapped and killed by the state. Merging documentary and fictional elements in an subjective way, it reflects and challenges individual and collective memory and its institutionalization. V OTROS MUNDOS. OTHER WORLDS. The program´s closing section is dedicated to the latest tendencies of Argentine cinema as a future prospect. In these films the distinct living environments seem to reach out and touch each other in daily life, work, family or culture. LOS LABIOS – THE LIPS (Ivan Fund and Santiago Loza, 2010) pictures the experiences of three women from the city, who volunteer in a socially disadvantaged, rural environment. Instead of featuring social milieus the movie blurs the borders of the otherness and highlights encounter of significantly diverging realities with respect and openness. In SUEDEN (Gaston Solnicki, 2008) the compelling music of composer and conductor Kagel stars as main character, inspiring the world of film making. Kagel re-encounters his birth-place Buenos Aires after an absence of 35 years in order to work with local musicians. In five segments the event investigates the rupture of a social and economic reality in interdependence with the development of genuine aesthetics in contemporary Argentinean cinema. The thematic introduction based on interviews with the directors of the respective films, exclusively produced by the curators in 2011, offers essential background information in order to inspire a wide audience. 18:00 OPENING: Welcome with Argentinian embassador. Segment 1: BODY, LABOR, CIRCULATION. Segment 2: INTIMACY AND DEGENERATION. Segment 4: ABSENCE OF THE STATE AND CRIME.